President Donald Trump’s advancement of the controversial Dakota Access Pipeline (DAPL), shortly after the Obama administration temporarily halted its construction, came with no surprise. Under the Obama administration, the U.S. Army Corps of Engineers, which has authority over DAPL, halted construction upon confirmation of the Sioux Tribe’s Treaty rights over Lake Oahe and its surroundings. It then prepared to issue an Environmental Impact Statement (EIS) to analyze DAPL’s full environmental impacts (which it failed to fully examine previously) and consider potential re-routings of the pipeline. Trump’s presidential memorandum, issued a mere few days into his presidency, effectively led to the abandonment of the EIS and an expedition of pipeline construction. Without the need for an EIS, Energy Transfer Partners (ETP) quickly gained the approval it needed to continue with the final construction of its 1,172-mile oil pipeline. Trump justifies his memorandum with the idea that, on top of providing jobs, the “lawfully permitted pipeline infrastructure” will “serve the national interest.” That the advancement of the pipeline may satisfy the interests of large portions of the nation, namely corporations, is true; however, Trump blatantly ignores the interests of Native American tribes, infringing on their legal rights and nullifying the pretense of lawfulness under which DAPL hides.­ Moreover, his memorandum is not only in violation of treaties the federal government has signed with the Sioux but also illegal according to federal environmental law, specifically in terms of the National Environmental Policy Act (NEPA). The rights granted to the federally recognized Standing Rock Sioux Tribe through both the 1851 and 1868 Fort Laramie Treaties have been repeatedly and wrongfully ignored, and this time is no different. The 1851 Fort Laramie Treaty both recognized the territory of the Sioux and also resolved to protect the Sioux “against the commission of all depredations by the people of the said United States.” The 1868 treaty, attempting to restore peace after the United States failed to prevent a wave of gold-seeking immigrants plundering Sioux territory after the first Fort Laramie treaty, promised that “no white person or persons shall be permitted to settle upon or occupy any portion of the [unceded Indian territory]; or without the consent of the Indians first had and obtained”, granting the Sioux tribe additional land on top of their reservation. Shortly afterwards, Congress non-consensually acquired a part of the Sioux land granted by treaty, resulting in a legal battle over lawful compensation that eventually escalated into Supreme Court case United States v. Sioux Nation of Indians (1980). The Sioux succeeded in receiving an award pension, but lost the land that was lawfully theirs under the second Fort Laramie treaty. Since then, Congress has continued to infringe on Sioux rights through multiple breaches of Treaty agreements, effectively establishing a pattern between the United States and the Sioux Tribe that manifests itself in Trump’s recent decision to expedite construction of a pipeline disturbing Sioux Nation territory and authorized without Tribe consent. In addition, the water rights of American Indian reservations, granted through the Winters Doctrine following Winters v. United States (1908), guarantees Native Americans rights to sufficient quality and quantity of the water sustaining their lifestyle. In the Sioux Tribe’s case, construction of DAPL poses a large threat to the cleanliness of the Missouri River—especially Lake Oahe, which is critical to the sustainment of Sioux homes, schools, businesses, agriculture, and industry, and which also marks the last stage of pipeline construction. Lake Oahe, a large reservoir on the Missouri River, is also a source of hunting and fishing for the Sioux Tribe. Because of its diverse and critical roles in Sioux lifestyle, acting as not only a mere supply of water but as a fishery critical to Sioux economy, the endangerment of its quality illegally infringes on the water rights of the Sioux people. President Trump’s cancellation of the Corps’ commitment to the Sioux Tribe directly ignores a slew of Native American rights guaranteed through multiple Supreme Court cases and treaties. Trump has the executive right to issue memoranda nullifying action from the previous administration; however, the actions catalyzed by his presidential memorandum unlawfully infringe upon Native rights, perpetuating an American tradition of illegally treading upon Native land. But such blatant infringement upon Native rights is an argument that has, due to its constant reoccurrences and the unfortunate status quo of American government, grown thin in both novelty and effectiveness. It may be more meaningful, therefore, to examine the unlawfulness of Trump’s memorandum on federal standards. 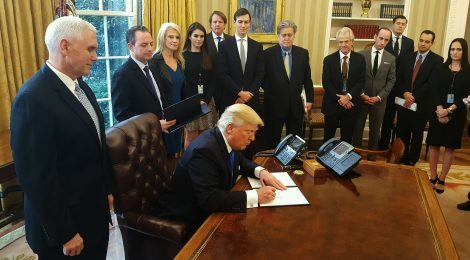 The presidential memorandum allows “to the extent permitted by law and as warranted, prior reviews and determinations, including the Environmental Assessment issued in July of 2016 for the DAPL, as satisfying all applicable requirements of the National Environmental Policy Act.” Trump’s automatic upholding of the Environmental Assessment—held by DAPL, no less—indisputably places corporate interests over Native rights supposedly secured by the law. Ironically, this injustice is pillowed by the recurring statement “to the extent permitted by law”, which accompanies each separate section of the memorandum. A closer examination in the laws delineating Sioux tribe rights, as well as the criteria of the National Environmental Policy Act (NEPA), reveal that the law actually does not permit Trump to blanket all prior reviews as satisfying NEPA and therefore cannot justify the completion of the pipeline. Every agency in the executive branch of the Federal Government must responsibly implement NEPA, under which Congress directed that all policies, regulations, and public laws be interpreted in accordance to NEPA policies. (Section 102 of the National Environmental Policy Act of 1969.) Congress prescribed the procedure of ensuring implementation of NEPA policies as “the NEPA process” or “the environmental impact assessment process.” Thus, the abandonment of the EIS, which is the environmental impact assessment process DAPL never received, is a direct and unlawful neglect of responsibility. In Sierra Club v. Peterson (1983), a Federal Court of Appeals determined that “If any ‘significant’ environmental impacts might result from the proposed agency action than an EIS must be prepared before the action is taken.” In cancelling the necessity of an EIS, which, in accordance to NEPA, should have been performed much earlier, Trump allows the Corps to unlawfully violate the criteria of NEPA. Moreover, there is inherent bias in an Environmental Assessment conducted by the company behind the pipeline. In addition to blindly accepting environmental analyses performed by DAPL, the Corps also failed to make such assessments available to the public or the Sioux Tribe, committing yet another breach against NEPA. Trump’s memorandum relies on the fact that all its commands are to be carried out “to the extent permitted by law and as warranted,” yet many of such commands are completely unlawful. It is no surprise that the Sioux Tribe, represented by Earthjustice (a non-profit environmental law organization), has already filed a lawsuit “seeking judgment that this easement decision, as well as the Corps’ July regulatory actions and accompanying NEPA analysis, are arbitrary, capricious, and contrary to law.” But if their upcoming court case is to look anything like those of the past, it would be misguided to expect a happy ending for the Sioux tribe. The United States has already proved itself capable of neglecting treaties that attempt to grant Native Americans agency, rights, and land, and such disregard of Native rights manifests in an unabashed ignorance of NEPA policies. There is little reason to believe that the new administration will be different. “Presidential Memorandum Regarding Construction of the Dakota Access Pipeline.” The White House. January 24, 2017. Accessed March 04, 2017. https://www.whitehouse.gov/the-press-office/2017/01/24/presidential-memorandum-regarding-construction-dakota-access-pipeline. Treaty of Fort Laramie, 1851., § 3 (1851). Treaty of Fort Laramie, 1868., § 16 (1868). National Environmental Policy Act, § 102 (1969). Sierra Club v. Paterson (United States Court of Appeals, District of Columbia Circuit. ).